The White Hag Beer & Liquor Co.. 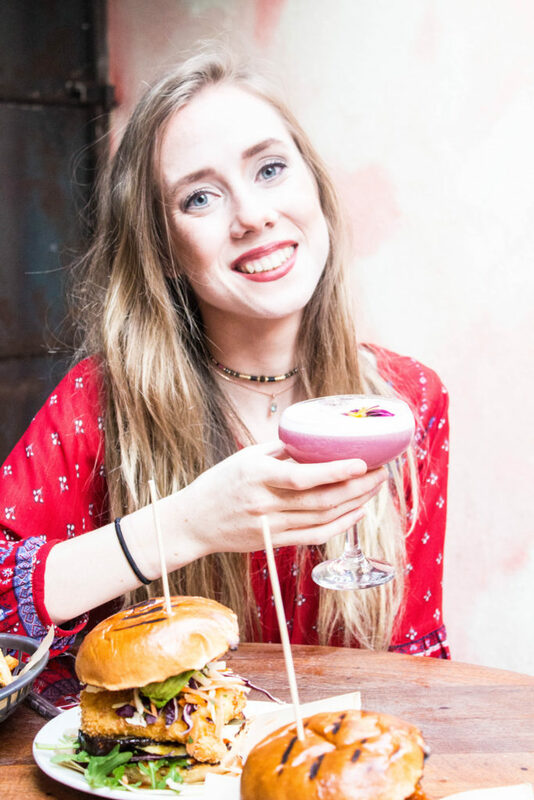 Recently one of our favourite Galway foodie spots invited us in to review their mouthwatering menu. 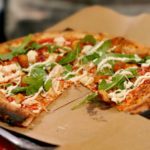 We are no strangers to Biteclub, so when we were asked us to come in and write our next ‘Where To Eat In Galway’ post about them, we couldn’t say no! 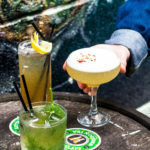 Biteclub is one of the best places in Galway for cool vibes and a chillaxing way to spend the evening, with great food, drinks, music and general atmosphere. The staff are lovely and there’s always a sense of quirkiness about the place. Upon arrival, we decided we’d love to sit in the rooftop garden while we eat our meal and were fascinated by lanterns, florals and bunting as we walked up the stairs. There are so many different delicious things on the menu to choose from, vegetarian falafel salad to crab tacos to Korean fried chicken. 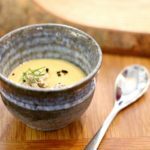 The menu is so versatile and there is definitely something on it for everyone. Now, let’s get down to business! What did we eat at Biteclub? 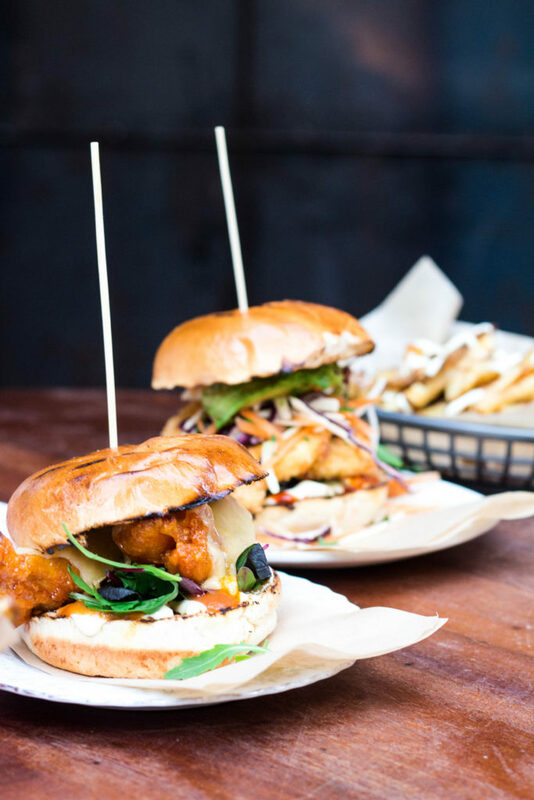 I had the louisiana fried chicken burger, a delicious crispy, spicy chicken burger topped with melted cheese and crunchy slaw. This burger is always tasty and a favourite of mine at Biteclub. I’ve tried a lot of things on the menu here since I moved to Galway. The chicken wings, mac & cheese, Korean fried chicken, the cheeseburgers, braised beef tacos.. The list goes on! But I always gravitate back to a good burger. Some people say it is easy to make a burger, but I say it is also easy to make a bad burger, and this one was delicious! 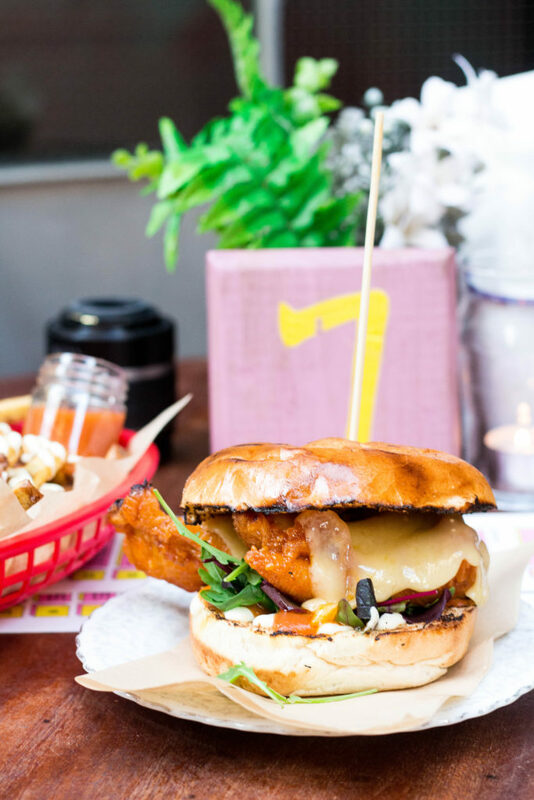 The slaw was fresh and crunchy, the chicken was tasty and everything was hugged together in a fluffy brioche bun. And don’t forget the fries! The home fries from Biteclub are some of my favourite around and covered in zingy lemon garlic aioli and served a cute little jar of homemade ketchup. 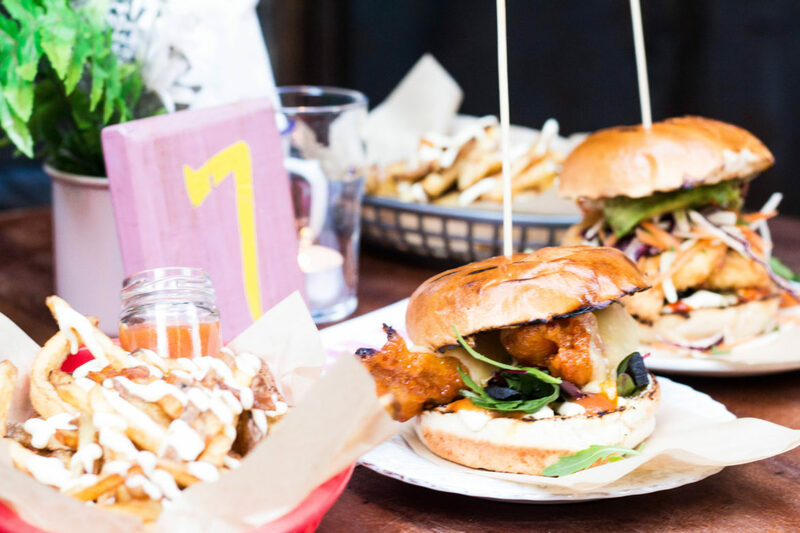 I already knew what I wanted before I even sat down – the halloumi burger and chips. 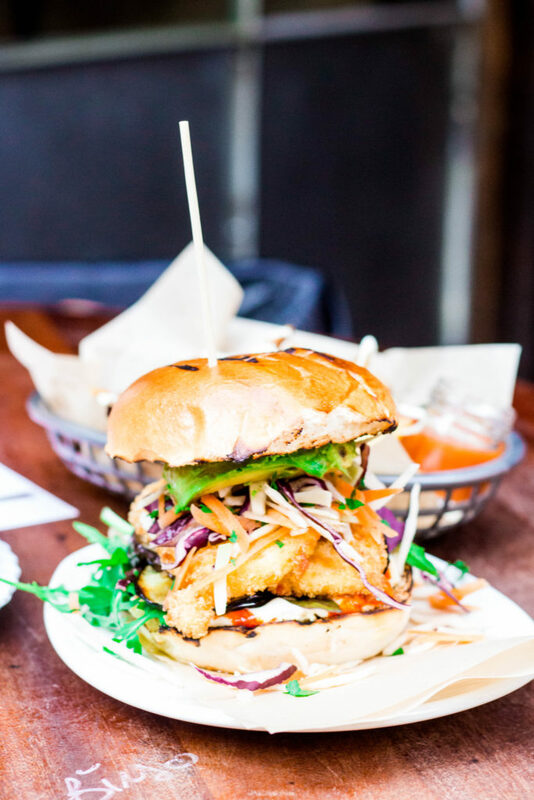 This is the mouth-watering burger combo that I dream about when I’m craving a vegetarian burger, delicious grilled halloumi and aubergine, burger sauce homemade slaw topped off with avocado. 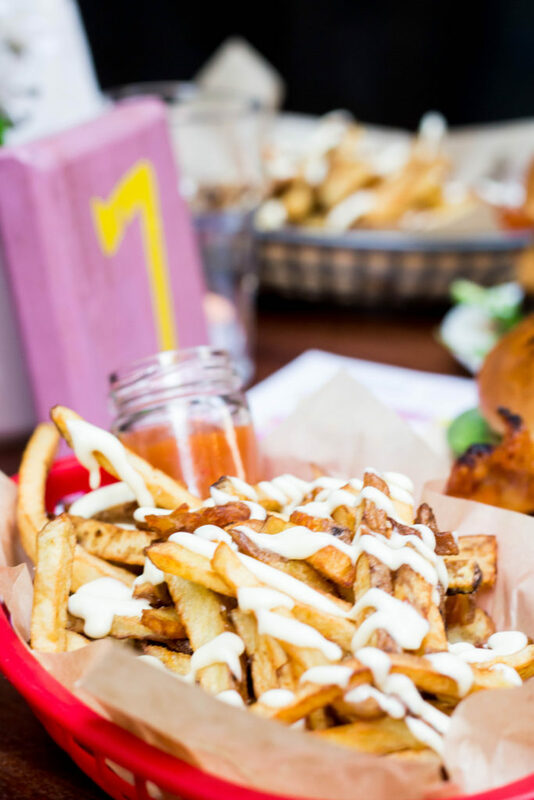 The chips come with garlic aioli and Biteclub’s homemade ketchup – NOM. So scrumptious. Every last piece of that burger was cleared off the plate, which made for some not-so-attractive photos of me eating it but it has to be done! 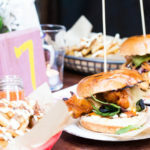 The last time I’d been to Biteclub before this, my friends and I went for the forty euro meal deal to share which included the halloumi burger and fries, the baby potato dahl with naan bread and the vegetarian courgette and feta salad tacos with a side of corn on the cob and potato salad AAAND two watermelon gin slushies. *catches breath* Yep, we ordered ALL of that, and it was heavenly. We enjoyed our meals with a cocktail each, Aisling went for the lemon meringue and Eilis went for the Rhubarb Sour. 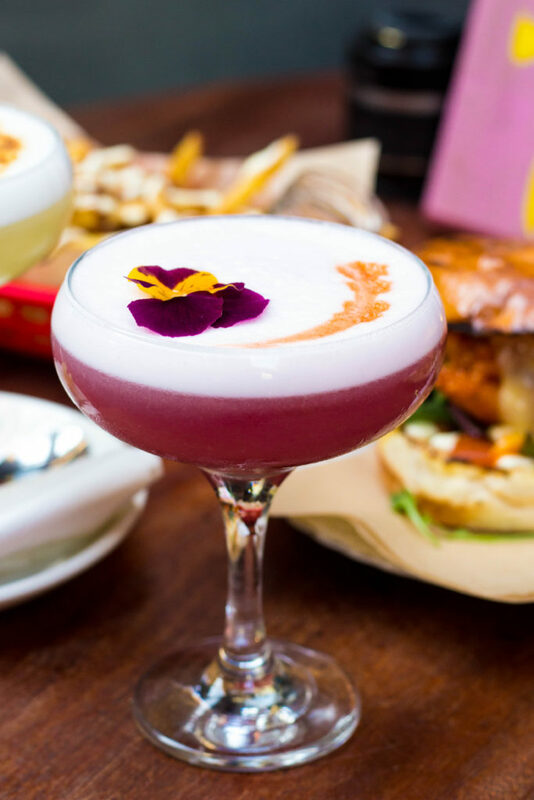 The lemon meringue sour was a drink made with lemon vodka. 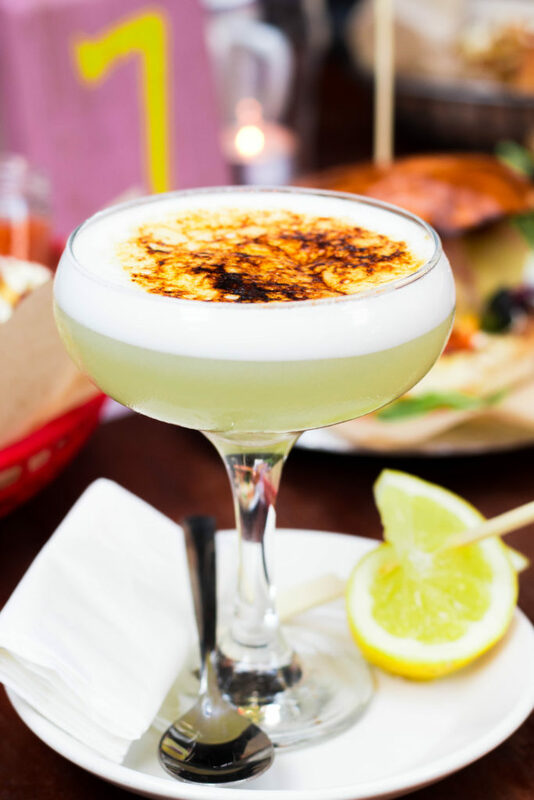 Fashioned like the dessert, the lemon meringue sour is torched at the top to leave a crystallised sugar coating that tastes absolutely delish! 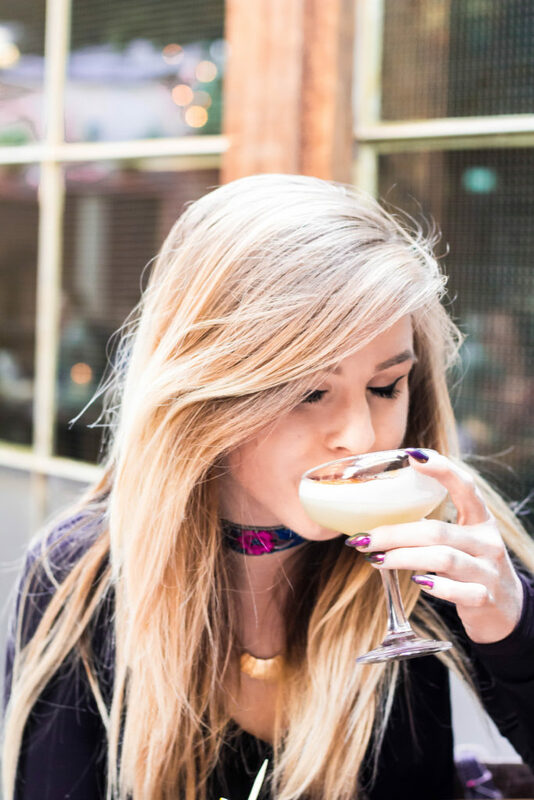 This was honestly one of the most unique and tastiest cocktails we have ever had! The Rhubarb Sour made with Eglinton gin, rhubarb bitters, lime and more. They were so tasty and beautifully garnished (10/10 would Instagram). As we left we spotted the Biteclub butterbeer cocktail, and as we are both Harry Potter fans and have idealised the world in which one can go to Hogmeades and sip on a butterbeer, we have vowed to come back again soon to give that a try! Overall, we would both one hundred percent recommend this as a restaurant to go to if you want to be greeted by friendly staff, served amazing food and put in a great mood while bopping your head to the tunes and being dazzled by the disco lights swirling around you. These are certainly the ingredients for the perfect evening!